The Pray-Care-Share concept is a balanced strategy for helping churches reach their communities for Christ. It starts with pastors and leaders. While they know that all of us are of one Church, many have become isolated and independent. 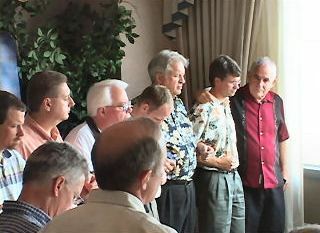 But with pastors and leaders together knowing each other as God’s creation, in partnership they pray together, share together and care together, and then spirits are fused, one to another. Leaders are changed, opening the doors for their churches to be transformed. PRAY! We learn to identify by name those in our social surroundings who need to know the Lord. They may be our brothers, sisters, relatives, neighbors, friends and work associates. People then write these names on bookmarks, on pictures, on walls of our churches or any designated place where they will be a continual reminder to hold others up in prayer. We are to actively pray for these people by name … that they will know the Lord as Savior and King. It becomes the focus for a change in our attitudes toward others. CARE! We discover ways that we can show we care. Visit with friends, be there to talk through issues with them. Help them with projects, visit with the elderly (that will be you someday! ), organize a work party with some friends, and do something for someone that they cannot do themselves. SHARE! When engaging with people, look for opportunities to share Christ. They will come up. Our love will be quite infectious and people will naturally want to know “what makes us tick.” Share your story. No one can argue with that. We don’t have to be a Bible scholar to be a witness for Christ! See Pastors’ Resources for ways to implement Pray-Care-Share in your own community.